I have been finding that since my children have gotten a bit older, they are much more into games than ever. The main reason is probably because they "get" it more now and it is so fun for them. Back in November I had the opportunity to attend the Chicago Toy and Game Fair. I have attended this fair before but it has been a few years so I thought it would be fun to go again this year. Needless to say, I had a blast. My children enjoyed playing with all the fun toys and games and I was able to meet some awesome companies that were showcasing some pretty fun products. One company that I met was SmartGames and they offer a bunch of games for children. Being that I am always looking for fun games for my children, they were one of my favorite booths there. I was thrilled when they contacted me after CHI-TAG and asked if I would like to check out one of their games and of course, I said yes. I had my choice of several games and so I chose to review Three Little Piggies. Just the name alone sounded so cute, I couldn't wait to introduce my children to this game. 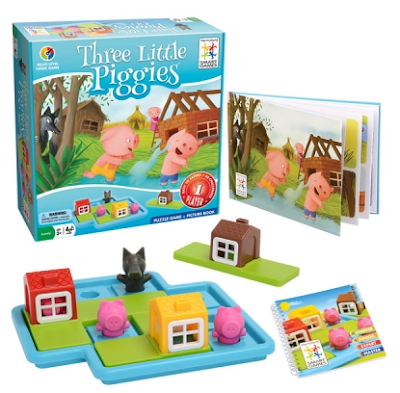 Three Little Piggies is a game of skill, problem solving and logic....all on a child's level. I love games but I love games even more when they trigger my child's brain. Three Little Piggies was developed with children in mind. I can tell when I look at the artwork on the box. It is modern, colorful and really draws in your curiosity. The best part??? I can be played by one or more children! I love this. This game doesn't come with a million tiny parts and playing pieces...it comes with a small, word-free story book, a playing platform with holes for the piggies to sit in, instruction book and layout suggestions, three house pieces and 4 playing pieces (4 piggies and a wolf). All of the pieces are made out of durable materials and are easy for little hands to hold. The piggies and wolf are made out of a rubber-like material. 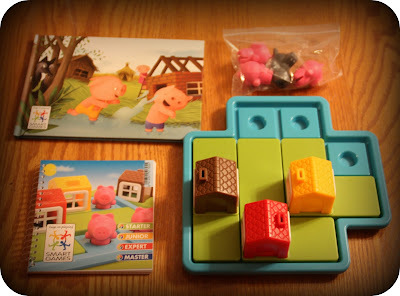 Basically, the idea of this children's game is to first set up your piggies (and wolf, if you choose to use a puzzle that includes him) and then try to fit the houses either over top of the piggies or around the piggies. Any puzzles that have the piggies outside are puzzles where the wolf is not around and when you are trying to fit the houses over the piggies, those are the puzzles where the wolf is lurking about. There are certain layouts that you can choose, which range from easy to challenging. My seven year old LOVES this game. She is a thinker and problem solver and basically FLEW through the easy puzzles. The more challenging puzzles took her much longer and she had a harder time with those but it kept her occupied for quite some time. 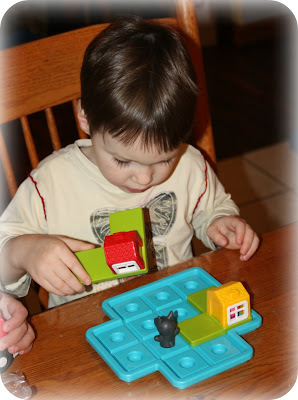 My three and five year old boys had a harder time...and basically played with the pieces, trying to fit the houses around and on the piggies. There wasn't much strategy or thinking involved with their puzzles but they had fun nonetheless. The age recommendation for this game is ages 3 and up so my 3 year old did pretty well considering. 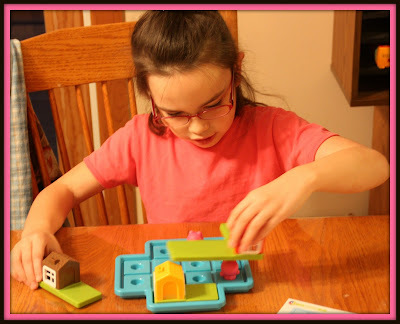 My children have a blast with this game and I love that it is so brain-engaging for them. I would definitely recommend this game to anyone with small children...it is the perfect activity for them and they can all play, either together or separately. 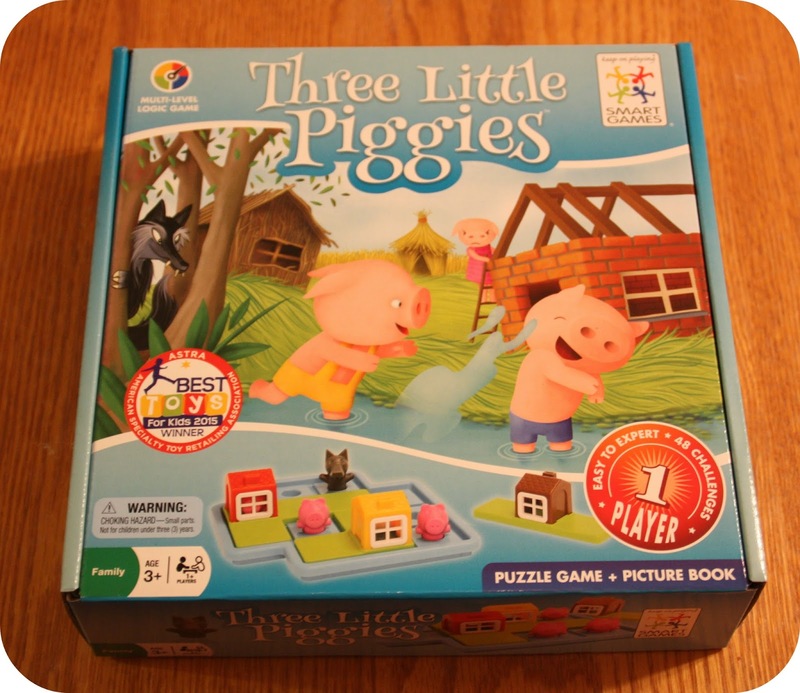 Three Little Piggies retails for about $24.99. Be sure to check out SmartGames on Facebook to stay current on new games and info! This does look like a fun and adorable game. I know when my daughter was young she loved anything to do with animals and would have loved this.